If your registered assets (RRSP and RRIF) totalled $500,000 at the death of the last spouse, your executor must include that entire amount as income on your final personal tax return. Such an income would bump you into the top tax bracket, resulting in a tax laibility of close to $250,000. 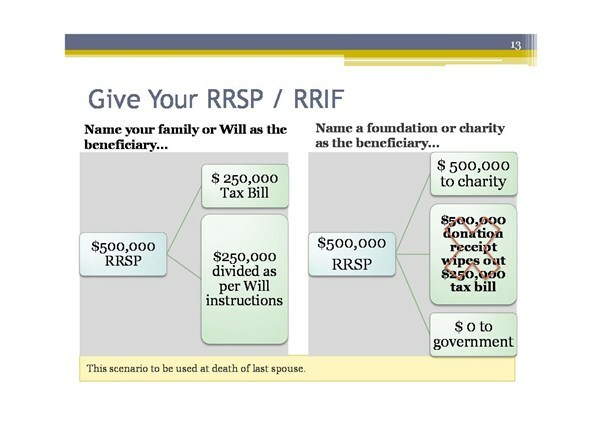 If you had chosen during your lifetime to name a charity as the beneficiary of your RRSP and/or RRIF (after a surviving spouse) then a gift of $500,000 would be made at your death. The resulting donation receipt would wipe out the tax liability on the personal tax return. The government would receive nothing. If you'd like several charities to share in the gift of your RRSP, why not consider using CNCF to facilitate the gift for you? You would have the opportunity to spread out the monies between any number of charities and your choices could be changed very easily during your lifetime.